Houston Roller Derby is hosting Midseason Tryouts on May 6th & 8th! Come out and show us what you're made of. We'll be seeking out new skaters to be apart of our 2019 season, and YOU just might be who we're looking for! Skaters must attend both days and be WFTDA insured. Think YOU have what it takes to skate for Houston Roller Derby? It is recommended that you get there early to fill out complete the registration form. All skaters must be 18 years or older. 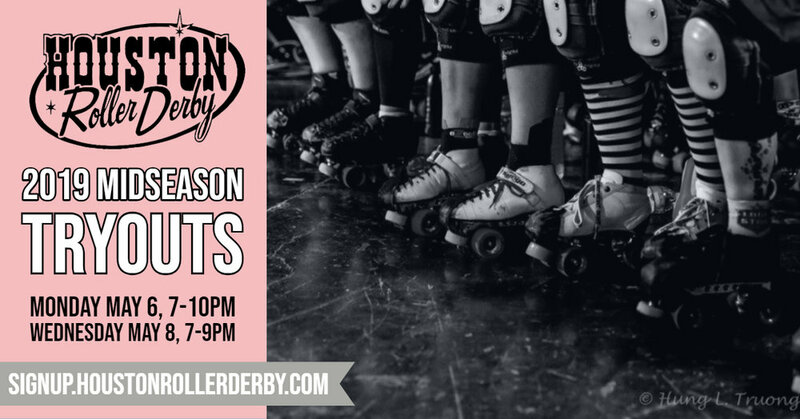 No previous derby experience is needed to tryout; however, you will be assessed on basic derby skills such as falls, stops, endurance, speed, and agility.